Friday was film study day for Benilde-St. Margaret’s. Red Knights coach Ken Pauly talked through selected highlights, many of them of them starring sophomore forward Jonah Mortenson. The Mortenson Show, Part II was unveiled on Saturday afternoon at Bloomington Ice Garden, as the 6-foot, 200-pound speedster set up the winning goal with a burst of speed down the left wing and some dizzying stickhandling that pulled the Wayzata defense and goaltender Danny Fraga out of position. Jonah Mortenson and Cooper Gay talk to SportsEngine's Loren Nelson after the 3-2 win. All he needed to do, then, was slide a pass to a wide open Cooper Gay, who cooly deposited the puck into an empty net with 2:41 left in the third period for a 3-2 Red Knights victory in the Class 2A, Section 6 semifinal. 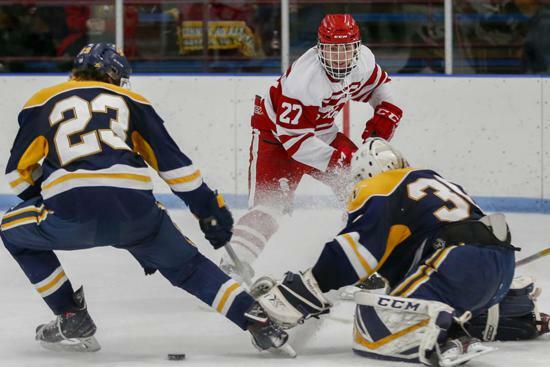 On two previous bursts down the left wing, Mortensen wheeled past Wayzata’s defensemen only to be denied on by Fraga on bad-angle, close-range shots. “You can’t go 0-for-3 coming down on those rushes,” said Mortensen, who had two assists in Thursday’s 7-1 quarterfinal rout of Holy Angels. “I think the goalie started committing my way, because on the previous two I shot right into him trying to go around him. Gay’s goal (he also scored Thursday against Holy Angels) was his 10th of the season. He came out of the St. Michael-Albertville youth system to join his longtime summer hockey buddy Mortenson. The pair flank center Charlie Bischel on the Red Knights' third line. It helps that each player knows his role, then plays it to perfection. It’s a pretty simple formula, to hear Mortenson and Gay tell it. 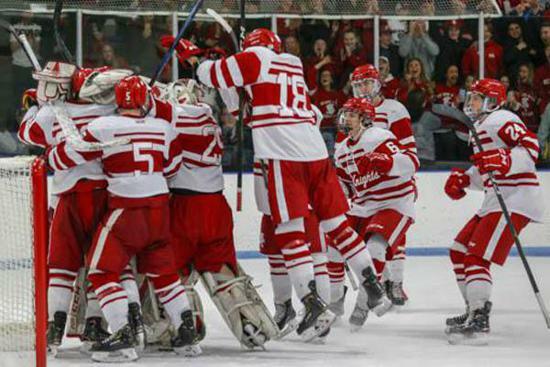 Benilde-St. Margaret’s (20-7-0) had defeated Wayzata 6-3 in the regular season and entered as the section’s No. 2 seed. The Trojans were seeded third. The matchup figured to be a study in contrasts, with the Red Knights, ranked No. 10 in the Class 2A state coaches' poll, playing a game predicated on speed and puck movement and the unranked Trojans (13-10-4) focusing more on puck possession and physical play. The game played out true to form, for the most part. Wayzata outshot the Red Knights 30-21 but couldn't capitalize on its handful of prime scoring chances. BSM advances to Wednesday's Section 6AA championship at 3M Arena at Mariucci versus the winner between Edina and Blake. The 8 pm game will be the Red Knights' second appearance at the University of Minnesota arena this season.